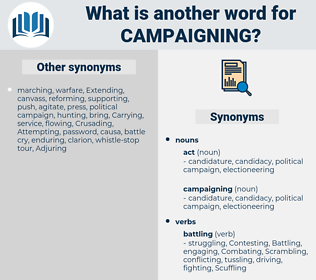 What is another word for campaigning? fighting, propaganda, mobilization, advocacy, publicity, mobilisation, advocate, awareness-raising. 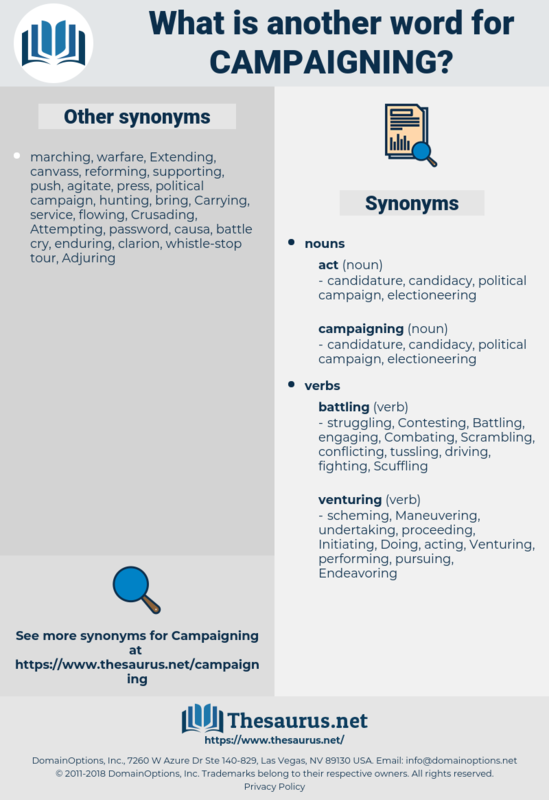 canvassing, propagandizing, warring, Combating, combatting, struggling, Militating, publicising, Experiencing, launching, Advocating, Persuading, exercising, Soliciting, calling, contending, arguing, competing, grappling, advancing, striving, appearing, Alleviating, pushing, Furthering, Championing, spreading, winning, propelling, facing, flying, Employing, Boosting, halting, dressing, beating, dealing, trying. Battling, agitating, running, electioneering, fighting. There goes Lord Cardigan to join the cavalry, observed their friend; he has been sleeping as usual on board his yacht; a pleasant way of campaigning, eh, Rogers?
" You've said some very disquieting things against some of my friends - of course, they understand that the exigencies of campaigning, the necessity of rousing the party spirit, the -" Thwing stopped short; De Milt held his breath. whispering campaign, hustings, front-porch campaigning, front-porch campaign, stumping. crusade, effort, movement, drive, cause, campaign.